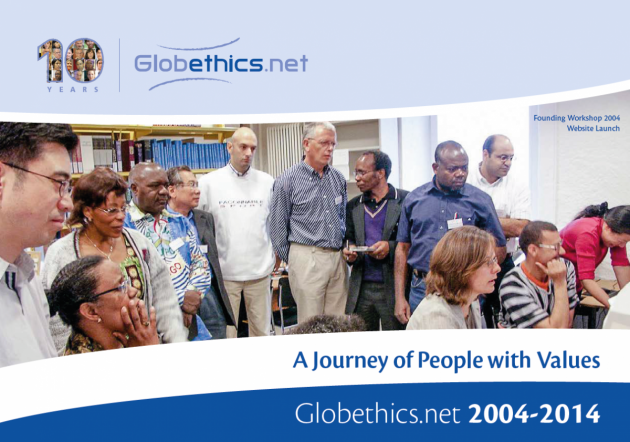 Globethics.net, a worldwide ethics network based in Geneva that provides an open electronic platform is celebrating 10 years of existence. Its central instrument is the internet site www.globethics.net. "Globethics.net has grown during the last 10 years on the basis of a commitment to open access, to the sharing of knowledge and information," for the benefit of all," said the founder of Globethics.net, Christoph Stückelberger. "The need and the demand are there for resources that are freely available, especially in developing and emerging economies." Basel University ethics professor Stückelberger said Geneva-based Globethics is dedicated to promoting access to its materials and to providing them across all fields of human endeavor. Rev. Martin Robra, special advisor to the World Council of Churches' general secretary, took part in the founding Globethics.net workshop in 2004. "When we heard about this idea - the vision, capacity and skill - it was exciting. The WCC could benefit by crossing boundaries on a variety of issues and concerns. We wanted to be associated with it and support it," said Robra. Two years earlier he had tried unsuccessfully to find young theologians and ethicists in different parts of the world in order to pool their knowledge on ethical matters. He was concerned about the many young voices not being heard simply because they had poor internet access or their theses were not widely published. During the anniversary event Globethics launched a free downloadable publication "More or Less Equal. How Digital Platforms Can Help Advance Communication Rights (2014)." It is co-published by Globethics.net with the World Association for Christian Communication which addresses communication rights in order to promote social justice. Marianne Ejdersten, a board of director of the WACC and WCC director designate of communications said, "The Christian tradition affirms that God invests all of humankind with freedom and dignity." She said Christians affirm, "that God stands especially with the oppressed and marginalized, working through history for their liberation. "WACC's key concerns are media diversity, equal and affordable access to communication and knowledge, media and gender justice, and the relationship between communication and power." Ejdersten noted, "In today's world, communication must be lifted up as a fundamental human right and communicators called to practice an ethics of freedom and accountability." Globethics.net programme director for Network and Partnerships, Lucy Howe López, said her enthusiasm for Globethics.net stemmed from the fact that it was an organization of people who cared. "Most can agree that ethics is important, fundamental even, that it serves as the foundation for law and human rights, that it guides our actions and the way we treat one another," said Howe López.